It’s August 1944. General Dietrich von Choltitz (John Bell) paces a hotel room in the heart of Paris. His orders have arrived: to ensure that Germany doesn’t lose its grip on the city – which seems inevitable – he must destroy it. A network of explosives has been laid. Millions will die. Landmarks will crumble. It’s expected to take, all up, about 20 minutes. But Paris still stands today, the city of lights. So what happened to make the General defy his orders? The answer to this history-changing question is the subject of Diplomacy, a French play by Cyril Gély making its Australian debut with a translation by Julie Rose. It details a tense and frequently funny clandestine meeting between the General and Raoul Nordling (John Gaden), the Consul General of Sweden in Paris, a French-born national. He’s come to plead the case of Paris – attempting to show the General the beauty of the city and trying to access his essential humanity. Essentially, it seems like the plan to save the future of France’s crowning jewel is to launch a full-scale charm offensive against this upstanding officer of the Third Reich. The charm is the angle that stands out strongest here: Nordling is unflappable, good-humoured and quick-witted, though it feels more sitcom than charm masterclass here in the intimate Ensemble theatre, which is full to bursting with Gaden: his laugh lines are broadly telegraphed and Bell’s resistance is more cantankerous than dangerous. It’s The Odd Couple: war edition. The hotel room is a makeshift command centre, and designer Michael Scott-Mitchell has placed a desk, with a few plot-crucial props, as our main focal point. It’s an economic, straightforward staging choice, but there’s a hint of romance and scale on the walls and on the floor – which are covered with an elegant illustrated map of Paris. It’s the set that takes care to remind us of the gravity of the situation. Obviously, a play about the significance and beauty of Paris has a different weight and impact in Gély’s native France than it will in lower north shore Sydney, but even allowing for this, Diplomacy still feels dissonant: we know Paris survives, and this production doesn’t give us much emotional buy-in to how close the city came to total destruction. Its sentimentality is too broad; its approach too Hogan’s Heroes to have much gravitas. 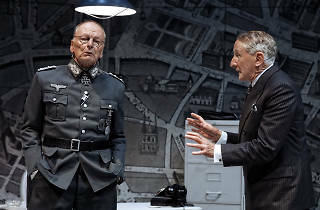 Rose’s translation is colloquial and regrettably heavy-handed – at one point, the General explains he believed that Hitler wanted to “make Germany great again” – and the work feels under-served by this contemporary reference and in its workmanlike direction, perhaps because Bell is splitting his time between starring and directing (Anna Volska is the assistant director). Genevieve Lemon, James Lugton and Joseph Raggatt appear in minor roles that border on superfluous, and we don’t have enough time with them for the purpose of these additional characters – to remind us of the expanse and risk of war – to really land. The basic premise of Diplomacy is a true story – though we don’t know what was said in that hotel room that night; we don’t know the magic words that saw the General grant Paris a stay of execution. 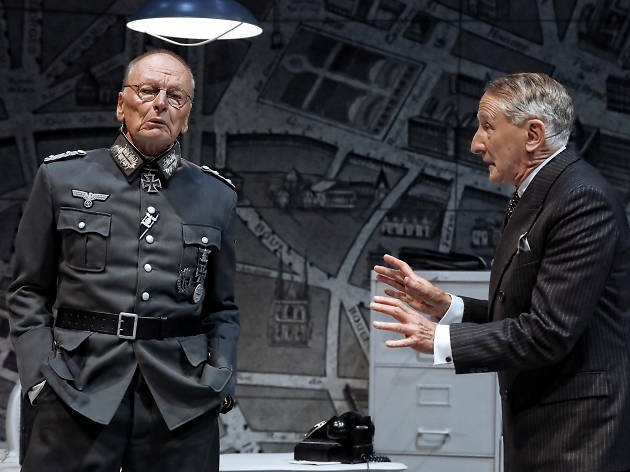 What is clear is that this production hovers somewhere between light entertainment and political thriller, and prefers the former to the latter. Expect comedy more than intrigue.